Invisible Braces - The Clear Alternative To Traditional Braces? If your teeth have gone a little wayward and you find yourself bowing your head in shame when you see your friend’s picture of you on Facebook or making a bolt to the kitchen on awkward family occasions when the dreaded teeth topic comes, you may want to consider Invisible Braces. Trust us, you’re not the only one that feels down about their teeth and more and more of our patients are using Invisible Braces to give them back their confidence and straighten their teeth. Some people think braces are ugly and evoke images of Ian Fleming’s fictional character Jaws gnashing his way through cable car metal in his pursuit of James Bond, but rest assured, braces have come a long way and can present you with the opportunity to achieve beautiful straight white teeth without the need for veneers and crowns or the not-so-wonderful ‘train track’ braces that ruined our dating chances when we were at school or college and had us looking like Ugly Betty. Thankfully, there is an answer for straightening those crooked teeth once and for all and it doesn’t have to involve frequent and painful adjustments. The techniques we use here at Ewan Bramley drive quick results and we use an invisible fixed brace system called Quick Straight Teeth Clear Aligners to get you smiling again. 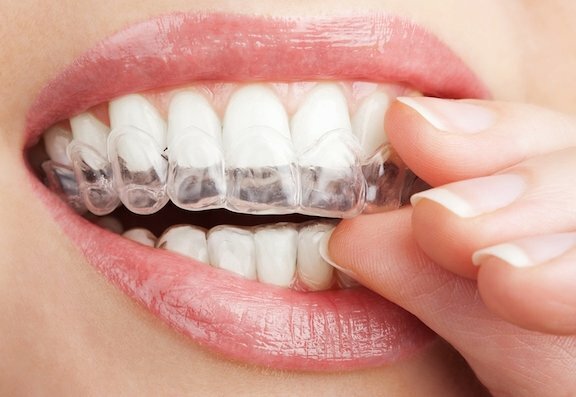 These aligners are a great example of how your teeth and smile can be revolutionised and are the perfect solution for crowding or protrusion of the front teeth. While a standard brace can take more than two years to create the perfect smile, this system can generate results in just four weeks and can nudge teeth back to where they belong without the pain and hassle of other techniques. Your front teeth can be gently guided to an ideal position in a matter of weeks and because it’s removable you can take it out to fit with your lifestyle. To find out more information about Invisible Braces and to see the difference it can make to your life, contact us today and we’ll be happy to set up a free consultation. Contact us here or call 0191 259 6506 today! Hi, how much do these cost?